As the Calgary Flames slim playoff hopes continue to dwindle with each passing day, it should follow that both the rabid (though consistently disappointed) fan base and team management alike begin evaluating how to improve a hockey team that has been treading water in the tough Western Conference for the better part of the last decade. This summer should truly be a summer of change for the hockey club as General Manager Jay Feaster will be able to put a definitive stamp on the team with the expiration of nine contracts, and six of those contract expirations leading to unrestricted free agent status. Among those players headed for the (money) green pastures of unrestricted free agency is centre Olli Jokinen, whose play this season has managed to both surprise and disappoint. 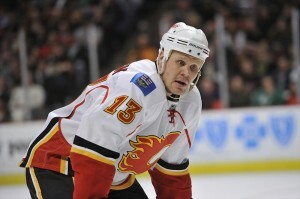 There are a myriad of factors that will determine Jokinen’s future with the team and it is public knowledge that the Flames centre would ideally like to conclude his career wearing the Flaming C. However, despite his relatively serviceable performance this season, it would be in the best interest for the team to end their affiliation with the Finnish centre. Given that the Flames will almost certainly miss the playoffs for a 3rd consecutive campaign, it is difficult to take a stance against retooling the core group of players that have managed to keep Calgary consistently mediocre. The expiration of Jokinen’s contract allows the team to focus on developing younger assets in the centre position at the NHL level. Should Jokinen (age 33) not be resigned, this would open up a top-3 center position for a number of young, willing candidates such as Roman Horak (age 20), Paul Byron (22), Mikael Backlund (23), and Blair Jones (25). All these players are relatively NHL ready and, in the cases of Horak, Byron, and Jones, Jay Feaster acquisitions. As a middling, older club the Flames need to begin giving priority ice time and development to younger players rather than seeking stop-gap solutions like Olli Jokinen. While the critics will maintain that these young players are not entirely NHL proven, no one can deny that all of them (excluding Jones) have the potential offensive upside that Jokinen no longer has. Jokinen, once a perennial point-per-game center, hasn’t had a season of 60 points or more since he left the Florida Panthers in the summer of 2008. He may eclipse that mark for the first time in that span this season should he garner two or more points in the final 6 games of the Flames season, but that in turn will only boost his value in terms of the open market and in effect become a wasted season of personal success on a non-playoff squad. Jokinen has become an inconsistent threat, as he is currently on a season-long 7-game pointless streak that also sees him sporting a weak -7 plus/minus rating. Simply put, as the second-leading scorer (58 points) on the team behind only captain Jarome Iginla (62 points), this performance is unacceptable. The Flames have been in survival mode for the last two months, and this abysmal performance by Jokinen during the most crucial stretch is an indicative reason not to renew his contract. As aforementioned, Jokinen may still be able to hit 60 points despite his recent season-long funk. While this may not have any playoff implications for the team, it certainly has salary cap implications. His current contract pays him $3 million per season, and given that he is coming off his best offensive season in recent memory Jokinen would logically command $4 million per year on a multi-year contract on the open market. While there are undoubtedly teams that would willingly pay the Finnish winger this amount it is far too rich for the Flames to match. Given the recent success of Michael Cammalleri and Matt Stajan as well as the bullpen of extraneous young centres the Flames have at their disposal, paying Jokinen $4 million (or more) on multi-year deal is essentially a gross over-payment for a fading, former superstar who is now capably suited for a 3rd line centre/power play specialist role. This situation is amplified given that Feaster will likely be moving the Flames in a youthful and inexpensive direction- two qualities Jokinen does not possess. While seeing Olli Jokinen momentarily display flashes of former brilliance this season has certainly been a feel-good story, the effort put forth is not enough to validate the Flames keeping him within the organizational fold- let alone at what will likely be a multi-year contract at $4 million per season. Feaster, while unable to alter the NHL facet of the organization due to the inheritance of poor contracts, has managed to stock the prospect cupboard at all positions and centre is not an exception. The Flames won’t instantly find success by foregoing resigning Olli Jokinen and replacing him with a young developing player, but by doing so will be essentially adding the same element to their hockey team in an inexpensive and increased-potential fashion.